Info "Reply to your friend's message using the perfect sticker! If you choose wrong, your friend might get a little annoyed." Sticking Point is one of Kat and Ana's microgames in WarioWare Gold. 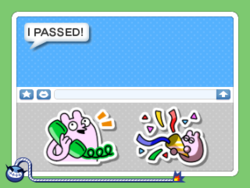 The player must choose a sticker that matches the friend reply. If the player choose a wrong sticker or time runs out, the game is lost. 1st level difficulty: Two stickers. 2nd level difficulty: Three stickers. 3rd level difficulty: Four stickers. This page was last edited on March 9, 2019, at 22:06.